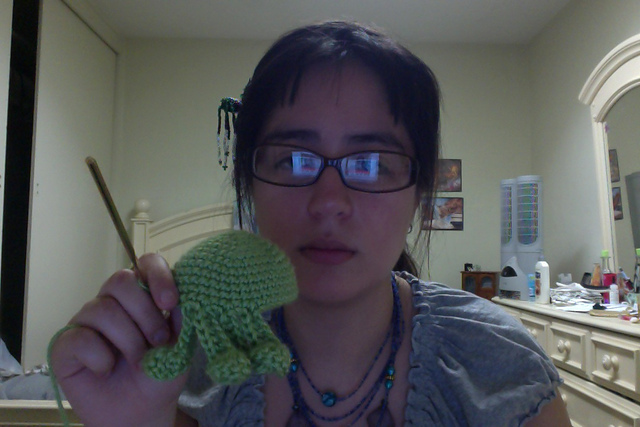 So I began to make an amigurumi Cthulhu last week, Tuesday after midnight. After all, why work on my chemistry lab report or on my Japanese when I can crochet? Anyway, was scared of the tentacles at first, but as you can see on my oh-so-smiley face, they were actually pretty easy to do. I'm also thinking of putting a squeaker in it, to make it the fearsome Elder God Lovecraft meant him to be.